We are offering the wide range of Strip gumming machine. Strip gumming machine are fabricated by the quality raw material. We have also set up a sophisticated manufacturing unit which is installed with a wide array of machines & equipment. 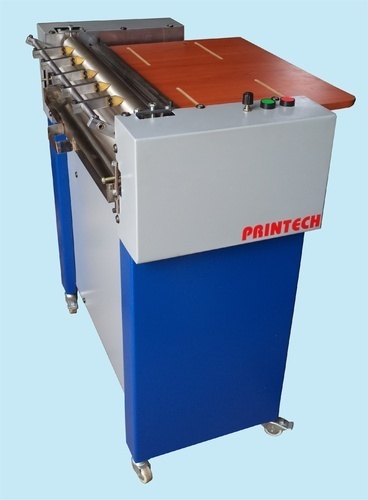 Printech Machineries is a very well known name in this raging market scenario of India. We are an old, trusted and reputed company which manufacturer, exporter and supplier different categories of various machineries which are used in printing presses and various other industries. Our product list includes Single Unit Machine, Double Unit Machine, Table Top Machine and many more products. We started our eventful journey in the year 2002 and during this long eventful journey time has shown us the graph of success to us. And fortunately we are still rising and improving day by day. We are a Sole Proprietorship Company. Our company has a very big diligent workforce and a very skilled team. All our employees are very much disciplined and very much devoted to the work they do. Our annual turnover of 50 Lakh-1 Crore INR speaks for itself about the tremendous milestones we have achieved throughout these years. This proves that surely we are the current leaders in every single aspect and we are very much sure that we will continue this acceleration in the coming years too. It is surely a sign of our brilliant success throughout all these years. Our major markets are US,Dubai,Kuwait, Middle East.